KENNEDALE -- Rudy Mata left this world for a far better and more beautiful place on September 25 2012. Rosary and Memorial Service: 6:30 p.m. Saturday, September 29, at Emerald Hills Memorial Chapel, Kennedale. He was preceded in death by his father Joe, mother Betty, brother Greg and sister Francis. He was born in El Paso, Texas on March 15 1956 to Joe and Betty Sue Mata. He graduated from Alamogordo High school in 1974. Worked for Stegmeier, LLC where he was a long term employee. He lived a life of great faith and worked passionately for his friends and family. Rudy loved to sing and was a member of the Saint Vincent de Paul Catholic Church Choir for many years.Rudy was a member of The Arlington Choral Society and Touch of Class. 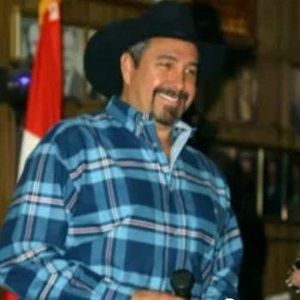 His many musical accomplishments were, 1994 Wylie Opry New Look Vocalist, Burleson Jamboree First Place talent contest, BCMA Entertainer and Male Vocalist of the year. In 1995 he received Male vocalist and Male Vocalist of the Year from Burleson Jamboree. In 1996 he received Terry Awards Male Vocalist of the Year, Grapevine Opry Male Vocalist of the Year. In 1997, he received Grapevine Opry Entertainer of the year and Male Vocalist of the Year. In 2000 he received Grapevine Opry Favorite Duet group of the year. Since then, Rudy has sung with Flipside, The Blue Beats, Southern Justice, Cavaliers, and most currently The Hi Rollers. His fans are based all over the United States. His voice and songs were notorious for their ability to change even the most sorrowful moods. He was blessed with a beautiful tenor voice and his family knows he now sings with the heavenly choir of angels. He was helpful to everyone and never knew a stranger. His laughter and wonderful personality could fill a room and people were drawn to his amicable personality and wonderful demeanor. He was a wonderful father, grandfather, and husband. He will be missed terribly. Survivors: wife Sandy, son Timothy and wife Jennifer, two daughters Trisha and Brittany, grandchildren Alex, Madelyn and Logan, his sister Sandy Hill, his father-in-law Ray Wiora, mother-in-law Diane McMahon and husband Norm, Dennis and Diana McMahon, siblings-in-law Susan and Michael Beane, Steve and Michelle Wiora, Shawn and Neena Wiora, Shane and Judith McMahon, Shelia Wiora and many nieces and nephews who will miss him dearly. Rudy was also blessed with countless close and wonderful friends. The beautiful and interactive Eternal Tribute tells Rudy's life story the way it deserves to be told in words, pictures and video. I ACCOMPANIED RUDY ON MANY OCCASIONS. HE USED TO COME BY MY HOUSE TO PRACTICE A SONG, MY DOG WOULD HOWL ALONG WITH HIM. WE BOTH LAUGHED. RUDY WAS ONE OF THE GREATEST - PERSON, SINGER, EMPLOYEE, A VERY GOOD & DECENT MAN WHO LOVED GOD. I KNOW GOD IS HAPPY TO HAVE HIM IN HEAVEN. MY PRAYERS TO SANDY & THE REST OF THE FAMILY. I WILL MISS HIM VERY MUCH. So many happy memories of that beautiful voice, and of the beautiful man from which it came. Rudy will long be remembered by all who were lucky enough to meet and become friends with Rudy and Sandy. We are all better for the experiences. I am so very sorry for your loss. Please know that you are in my thoughts. My eyes were filled with overflowing tears as I heard the unthinkable and dreadful news of my dearest cousin Rudy. Words, however kind cant mend our heartaches. May we find the strength in the love of our family and the warm embrace of our closes friends and cherish the memories of my cousin Rudy Mata. I love you. My most sincerest condolences to my cousin Sandy Hill. Rudys wife Sandy and his daughter Brittany. Know that you will always be in my prayers. I had the privilege of singing with Rudy a few times - through church and most recently last year at a military tribute in Mansfield. I cannot express how much I appreciated his beautiful, tenor voice - it was a God-given talent that he shared with others. His voice made this piece of the world more beautiful. I am so happy to have had the honor of creating music with him. My heart and prayers go out to his wife, Sandra, and to all his family and friends - he was a wonderful human being and he will be greatly missed. I'm so sorry for your loss! My prayers are with you and please let me know if I can do something for you. Words are so inadequate & emotions overwhelming at a time like this. Fortunately for us, Scripture holds hope & promises. The Gospel of John reminds us not to let our hearts be troubled or afraid. Peace & everlastinng life are assured. Know that you are being prayed for by many of my friends and fellow parishioners. I met Rudy years ago through the Opry circuit. Aside from his great talent as a vocalist, what left the greatest on myself and others was his kind heart, soft spoken words and his down to earth humbleness... always wearing a smile. A true gentleman and a great example for others to live by. It is truly a tragedy that his life was taken so soon from this world, but you can rest assured that he's singing among the angels in Heaven. God Bless Rudy and the Mata family. You're in our thoughts and prayers. If there is any comfort we can give from such a tragic loss, let it be that you know how many lives Rudy touched with his immense talent and wonderful personality. It was an honor to share the stage with him but, even more, it was a privilege to know him as a person. His was a rare soul and our lives were enriched by his presence. We will miss him greatly.